This week we shipped mud gas separator and waste collection box to Sinopec. The mud gas separator normally installed before the solids control system and on the trip tank skid together with chock manifold. Right now all the oil well drilling and mining drilling require mud gas separator to avoid kicking off, sometimes they also need a flare ignitor device. 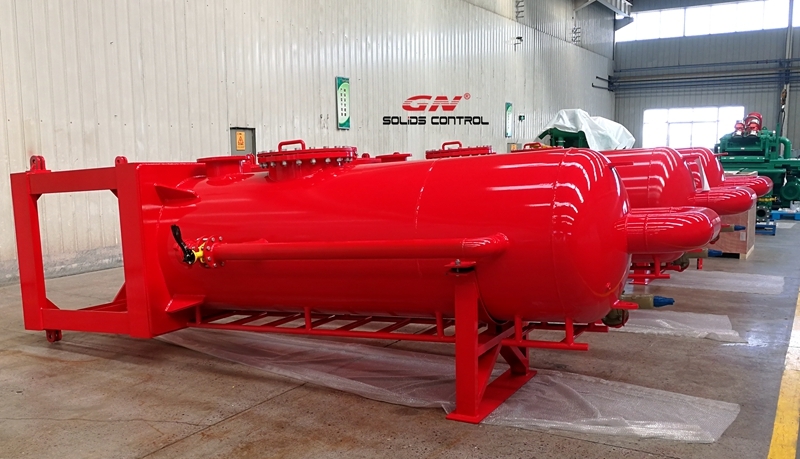 Several month ago GN solids control also shipped one set of mud gas separator and one set of flare ignitor to Indonesia. Both of them will be used in the rig site, the mud gas separator is used before solids control system, the waste collection box is used to collect the cuttings from the solids control equipments. Vacuum pump, Oil sludge separation system, TDU, Dewatering unit, solidification unit, drilling waste collection box, etc.